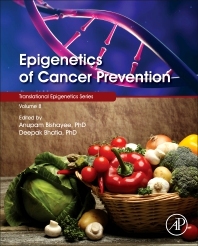 Epigenetics of Cancer Prevention, Volume Ten is the first to look at epigenetics and chemoprevention together. Although there is numerous scientific data available on how epigenetics can lead to cancer and how chemoprevention can be beneficial in the treatment of, or improvement of quality of life, together they will set an advanced understanding for the reader in this upcoming field of chemoprevention influencing epigenetics. This book discusses molecular epigenetic targets of natural products, such as green tea polyphenols, curcumin and resveratrol, and organ specific epigenetic targets related to diverse types of cancer, for example prostate, colorectal, breast, lung and skin cancers. Additionally, it encompasses a discussion on research methods and limitations to study epigenetics and epigenomics of chemopreventive drugs and personalized cancer treatment with phytochemicals. The book is ideal for cancer researchers, health care professionals and all individuals who are interested in cancer prevention research and its clinical applications, especially in natural remedies. Great book with up-to-date information about the epigenetic possibilities for cancer prevention with natural compounds. Worth the price! Dr. Bishayee has 25 years combined experience in pharmaceutical education, research, teaching and administration. His primary research interest during last two decades encompasses cancer biology, cancer therapeutics and cancer prevention. His laboratory is involved in investigating mechanism-based chemopreventive and therapeutic effects of various medicinal plants, natural products, dietary and synthetic agents using various pre-clinical models of cancer. The various projects of Dr. Bishayee are funded by the National Institutes of Health as well as private pharmaceutical/biotechnological companies. Dr. Bishayee has published at least 170 original research papers and authoritative review articles in high-impact, peer-reviewed journals and 15 book chapters, and presented over 25 papers at various national and international scientific meetings. Dr Bishayee is the Editor-in-Chief of two journals and has acted as guest editor of various journals thematic issues. He is also serving as an editorial board member and ad-hoc reviewer of more than 50 reputed journals. Dr. Bhatia has 10 years of experience in pharmaceutical education, research and training medical, pharmacy and graduate students. His essential research interest is in mechanistic studies of solid tumors and use of plant-based therapeutics for malignancy aversion. His research involves utilizing both in vitro and in vivo techniques to study gene regulation and epigenetic regulation of key genes and proteins involved in growth suppression, proliferation and inflammation. Dr. Bhatia has extensively published original research papers and review articles in high-impact, peer-reviewed journals and contributed to numerous book chapters. He has presented his research both at national and international scientific meetings. Dr. Bhatia is an Editor of two journals and serves as an editorial board member and ad-hoc reviewer of many reputed journals.